Many times when a solvent or adhesive is used it is important that it is not applied too thick. Microscope World recently had a customer that needed to measure the thickness of an adhesive they were applying in the manufacturing process. Making sure they were not using too much of the adhesive saves money on supplies, and also ensures that the adhesive cures properly to apply a solid bond. Adhesive edge captured at 50x magnification. Using the MT7100 metallurgical microscope, images of the adhesive edge were captured using the DK5.1P 5 megapixel microscope CCD camera. The included advanced imaging software allowed analysis and measurement of the samples once images were captured. 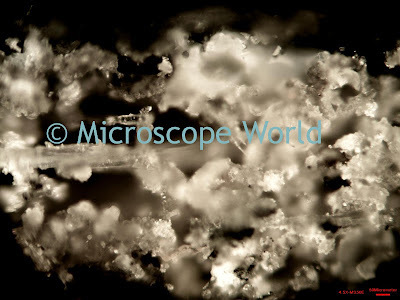 Adhesive edge captured at 100x magnification. Adhesive edge captured at 200x magnification. If you have a similar application and need some help determining how to best measure substances, contact Microscope World.